1. How does ULTRA EVER DRY work? The bottom coat bonds to most materials and acts as a primer. It provides a consistent material for the top coat to bond to while interacting with the top coat to self-assemble the surface, creating finely textured geometry. This surface is comprised of patterns of geometric shapes and billions of interstitial spaces. There are "high points" in the surface that help to create a low surface energy, which causes droplets of water to touch a very small percentage of the coating. The water in the droplet that does not touch these "high points" is held together by intermolecular cohesive forces of the water molecules. It is the combination of these elements that allow ULTRA EVER DRY to be superhydrophobic and oleophobic for some, but not all, oil-based liquids. 2. What do the terms "superhydrophobic" and "oleophobic" mean? ULTRA EVER DRY surface protection coating creates a solid/liquid contact angle of 160-175 degrees in air. Well-known windshield water repellents have a contact angle closer to 110 degrees and are only hydrophobic. A superhydrophobic contact angle allows for the self-cleaning properties associated with ULTRA EVER DRY. Oleophobicity refers to the ability to repel some, but not all, oil-based liquids (which have values of surface tension less than that of water). Unfortunately, oleophobicity is not an absolute term, as many oils have broad ranges of surface tension which may straddle the limit of the effective range of ULTRA EVER DRY. For many oils, testing is required to determine if the specific oil or grade of oil will be repelled by ULTRA EVER DRY. 3. How long will ULTRA EVER DRY coating last? The ULTRA EVER DRY formula is susceptible to environmental conditions such as UV. This coating will offer approximately one year of outdoor life before recoating of the top coat would be required. When used in indoor or covered applications outdoors, the coating should last for a year or more. If the top coat has diminished due to environmental conditions, simply reapply the top coat to regain the superhydrophobic properties (assuming the bottom coat is still present). ULTRA EVER DRY coating is also susceptible to abrasion. 4. What is the working temperature range for ULTRA EVER DRY? The working temperature range for a coated surface is from -34°C to 149°C once it has been applied. We would recommend further testing for any application that will be exposed to temperatures above 149 °C. The coating should be applied at temperatures between 10°C to 32°C. 5. What materials will the ULTRA EVER DRY coating adhere or bond to? Please note that the coating has a hazy translucent white appearance. Almost any material is a candidate for application: steel, aluminum, other metals, plastic, leather, fabric, wood, concrete, etc. The coating can be applied to and will bond to smooth surfaces. Preparing an already cleaned surface with heavy-duty scotch brite and/or sanding the surface with 320-800 grit sandpaper will improve adhesion. ULTRA EVER DRY is not recommended for use on acrylics due to the high solvent content. 6. How abrasion-resistant is ULTRA EVER DRY? ULTRA EVER DRY surface protection is significantly more abrasion resistant than previous superhydrophobic materials, registering a result of 30 cycles with a CS-10 wheel and 1000g load on the Taber Abraser before droplets no longer roll off the coating at a slope of 5 degrees from horizontal. The coating may still be superhydrophobic at this point, but droplets may "pin" or stick in the abraded area, and may not roll off until the substrate is tilted to a greater degree. If abrasion is a concern, testing is recommended. If the coating is removed due to repeated or severe abrasion, it can be reapplied. 7. Will the coating still work if the top coat is largely removed due to abrasion? Perhaps. In many situations, the superhydrophobic nature of the material may be diminished but the remaining top coat and bottom coat still provide the functionality of keeping the coated material from getting wet, iced up or corroding. This is application dependent. 8. What color is the surface coating? The standard product is a hazy translucent white. We do not have a transparent formula at this time. Custom colors are not available at this time. It is recommended to try the coating in an inconspicuous area first if color is important. 9. How many square feet or square meters can a gallon cover? 250 square feet or 23 square meters at a dry film thickness of 13 microns. 10. How long does ULTRA EVER DRY take to cure? Bottom Coat: Allow 30-60 minutes of dry time before applying top coat. A heat gun / blow dryer may be used on a low setting to decrease dry time. Top Coat: The coating will become superhydrophobic within 15-30 minutes of the top coat application. Allow 2 hours of additional dry time for good results. For best results, including optimum oleophobicity, allow the bottom coat to dry for at least 1 hour and allow the top coat to dry overnight. 11. What is the shelf life of ULTRA EVER DRY and what temperature should it be stored at? Typically, shelf life of the product will be two years when stored between 4°C and 40°C. 12. Does UV affect ULTRA EVER DRY? ULTRA EVER DRY coating is adversely affected by ultraviolet (UV) light, reducing its useful life. Additional ULTRA EVER DRY formulas are being developed to reduce the effect of UV light. 13. How chemically resistant is ULTRA EVER DRY? As with most materials and coatings, this will depend on the chemical. In general, it is resistant to a wide range including many water-based acids and bases. It may or may not be compatible with oil-based liquids, since these substances have varying values of surface tension, and liquids with low values of surface tension are not compatible with ULTRA EVER DRY. Testing may be required to ensure proper compatibility. ULTRA EVER DRY surface protection will not work organic solvents including, but not limited to: acetone, xylene, t-butyl acetate, naphtha, MEK, etc. 14. What known chemicals are incompatible ULTRA EVER DRY coating? Soaps and detergents will cause the surface of the coating to "wet-out". Once these chemicals are removed (using low pressure water), the superhydrophobicity will generally return. Alcohols and solvents will dissolve/remove the coating. 15. How well does ULTRA EVER DRY stand-up to acids/bases? Strong acids and bases are typically not a problem. Testing has been completed with sulfuric, hydrochloric, and phosphoric acid with excellent results. We have also seen good results shedding strong caustic and some bleach solutions. 16. Will ULTRA EVER DRY help prevent corrosion? Yes, ULTRA EVER DRY surface protection coating is corrosion resistant. Increasing the bottom coat thickness will increase longevity. Applying ULTRA EVER DRY on top of existing painted surfaces, polyurethane coatings or other treated surfaces will increase the effectiveness and longevity of the pre-existing treatment. 17. How is ULTRA EVER DRY coating applied? ULTRA EVER DRY surface protection coating is best applied using a spray method, either with traditional air-compressor driven HVLP paint sprayers or airbrush paint sprayers. NOTE: Both parts (top and bottom coat) are required for all applications of ULTRA EVER DRY. We do not have data showing consistent results with other coating methods at this time. NOTE: With all sprayer options, it is important to adjust the volume to allow ULTRA EVER DRY to be applied in a fine mist. HVLP Spray Gun: For medium/large jobs. Use Warwick 881H or similar, 1.7 mm needle/nozzle set. Air conditions: cool, dry, 40-45 psi line pressure, 24-28 psi working pressure. Create a fine mist. Airbrush: For small jobs. Use Iwata NEO BCN or similar, tip size ≥ 0.5 mm. Air conditions: cool, dry, 10-60 psi working pressure. Create a fine mist. See specific sprayer manufacturer instructions for safe and proper usage. 18. Is it electrically conductive? No, it is not electrically conductive. It can be safely used to coat electric motors, switches, electrical components, electronic subjected to the elements, light fixtures, etc. 19. What does this product do to the transmission of air through a material? The passing of air through the coating is dependent on the substrate. There are surfaces where the coating can act as a liquid repellent under low pressures, but allows for the permeation of gases or vapor. If the bottom coat is applied too thick and makes a continuous film across the pores of the substrate, then air transmission will be diminished. 20. Is ULTRA EVER DRY surface protection coating flammable when it is dry? Polymer binders do not offer flammability resistance as polymers are carbon-based molecules and therefore will eventually burn or melt. Please note, however, that the dry coating thicknesses are generally only about 25 microns. We expect the overall flammability will be determined by the article being coated. We advise application-specific testing if flammability is a concern. 21. If ULTRA EVER DRY is applied to fabrics, will it wash off? Yes, after few washes and in some cases after a single wash.
22. Do you recommend using ULTRA EVER DRY inside of a pipe with constantly flowing liquid? No, this is not a good application, unless the fluid is slow-moving (laminar flow). In most cases, the liquid flowing through piping will be turbulent, causing ULTRA EVER DRY surface protection to abrade away. 23. It seems like the ULTRA EVER DRY coating is rubbing off onto my hands. Is that normal? The whitish coating that comes off in your hands if you rub it is excess top coat particles that did not bond to on the bottom coat. NOTE: Due to the natural oils in the skin, excessive handling with bare hands of treated materials can cause a reduction in performance. 24. What is the return policy for ULTRA EVER DRY coating? All sales are final. We are unable to accept returns on the product because of the shelf life (2 years). 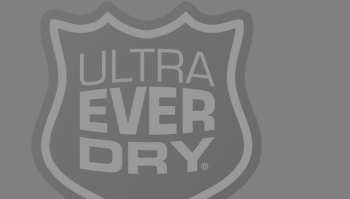 ULTRA EVER DRY is stamped with a “best by” date and because of that, returns are not practical. 25. Is ULTRA EVER DRY coating comprised of, or is it produced using, Ozone Depleting Substances (as defined in the Kyoto Protocol and listed in Annex A of the Montreal Protocol, as amended)? No, ULTRA EVER DRY is not produced using any Ozone Depleting Substances (as defined in the Kyoto Protocol or listed in Annex A of the Montreal Protocol, as amended. 26.How does ULTRA EVER DRY coating work against with crude (natural, organic oils)? ULTRA EVER DRY surface protection generally does not have good resistance to crude oil. This is mainly due to the solvents in the crude oil which actually dissolve ULTRA EVER DRY. 27. Does the ULTRA EVER DRY prevent powder accumulation on metal walls? If there is no water or other liquid available to clean the coating, then the coating is not effective. It is not smooth or slick, it is actually a rough surface and may actually end up holding more powder in this application. 28. Is silicone one of the ingredients in the ULTRA EVER DRY product? There is no silicone, but there is a non-crystalline, fumed silica in the Top Coat (it is listed on the Safety Data Sheet). 29. Is the proprietary additive toxic? All proprietary ingredients are non-hazardous. 30. What is the NFPA and HMIS information for ULTRA EVER DRY surface protection coating? 31. Can I use ULTRA EVER DRY on my car? Our product can be used on cars but we recommend only using it underneath the vehicle. 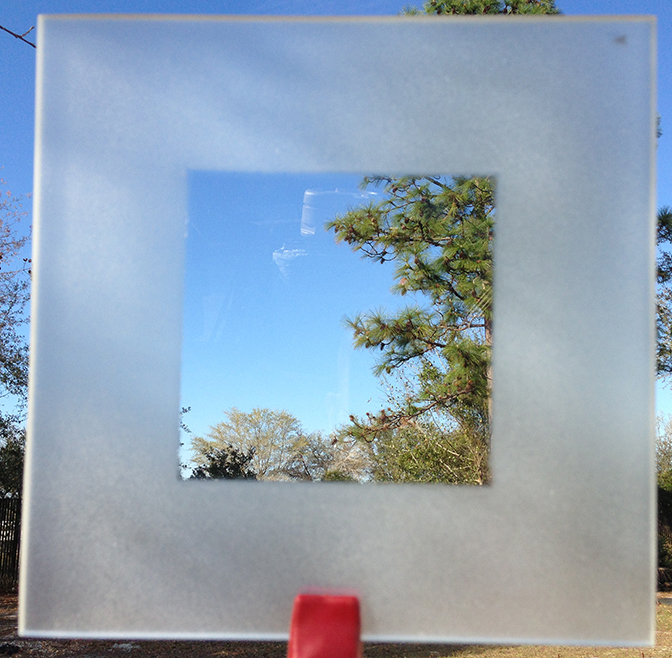 It is not recommended for use on body panels or windows/windshields because of the translucent white color (Click here to see a glass pane treated with ULTRA EVER DRY). It is recommended to try the ULTRA EVER DRY in an inconspicuous area first if color is important. It will cover a gloss paint with a dull, matte finish. Some exceptions to this recommendation is using ULTRA EVER DRY on work vehicles such as cement trucks or off-road vehicles where aesthetics are not as important as cleanliness, anti-corrosion, anti-icing and maintenance. 32. Can ULTRA EVER DRY surface protection coating be used to prevent graffiti? Surfaces coated with ULTRA EVER DRY will not prevent oil-based paints from being applied, due to the solvents in the formulas. It has been shown to be somewhat effective with water-based paints however the majority of spray paints are oil-based. 33. Can I spray this on the bottom of my boat? We do not recommend applying ULTRA EVER DRY surface protection coating to the bottom of a boat or ship. The flow is quite often turbulent in these areas, and this high energy (and high velocity) flow can damage and/or remove the coating. ULTRA EVER DRY may have potential on slower-moving and less turbulent applications, such as the bottoms of canoes or kayaks, but we do not have data for these applications yet. 34. Can I use ULTRA EVER DRY on my skis, snowboard or surfboard? We have not had the opportunity to test Ever Dry for these applications. 35. Will spraying ULTRA EVER DRY on my phone make it waterproof? 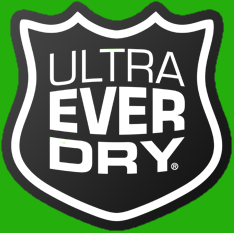 ULTRA EVER DRY does protect electric connections from water and moisture and is non-conductive, but ULTRA EVER DRY is not clear. It dries to a translucent white color, so we cannot recommend spraying phones with it.